On one of three Saturdays in March of 2014, Phil Seipp, along with Rotarians Diane Landsberg and Norby Rudel were conducting the TBM annual student interviews at the Miami-Dade County Medical Examiner’s offices. The team had already done their first 2 or 3 interviews. They kept seeing these nice new suits come in & sit before them with very bare lapels. Rotarians wear their Rotary insignia proudly on their lapels, and so they asked a couple of students how they would feel about some kind of TBM pin. The response was very positive. Then, on April 15, 2014, Miami Rotary had a TBM evening reception at Northern Trust Bank with then UM Medical School Dean Goldschmidt and some TBM recipients. After the Dean’s remarks, Phil Seipp spoke briefly & unveiled a proposed design of the new TBM Scholar lapel pin. In designing the pin, he, of course, wanted the Rotary dark blue and gold. He also wanted a medical symbol. After a little research, the overused caduceus with its entwined twin serpents was abandoned in favor of the Rod of Asclepius, the snake-entwined rod wielded by the Greek god Asclepius, a deity associated with healing and medicine. Healing Temples of Asclepius had once been established throughout the ancient Greek world including one on the island of Kos where Hippocrates, the legendary “father of medicine”, may have begun his career. In honor of Asclepius, a particular type of non-venomous snake was often used in healing rituals. These snakes, Aesculapian Snakes shown in brown on the pin, often slithered around freely on the floor of the rooms where the sick and injured slept. The design was completed with the words “TBM TRUST” in a sanguine red on a sterile field of white. The new pins arrived at the end of May. Well, the cloisonné-style pins came out even better than ever anticipated. Now, we had a reason to get together with the students of our local medical schools. The UM Miller School of Medicine was very enthusiastic and worked hard to arrange an event to celebrate the very first group presentation of our new TBM Scholar lapel pins on Wednesday, October 29, 2014 in the lobby conference room of the new UM Life Science & Technology building, new home of the UM Bone & Tissue Bank. The event was well attended by both Miami Rotarians and UM faculty & staff and set the stage for annual events to follow. In a similar vein and another stroke of good luck, TBM Co-Trustees Phil Seipp and Diane Landsberg were invited by new Rotarian Cathy Cahill to a lunch & tour of FIU in June of 2014. They then set a meeting with Director of Financial Aid Marissa Miles in July and attended the FIU Herbert Wertheim College of Medicine White Coat Ceremony in August forming a great relationship. From all this, it was only natural that the Inaugural FIU TBM Pinning Event would follow on Friday, January 30, 2015.
Who could ever have predicted what “this little pin” would start and help bring about? 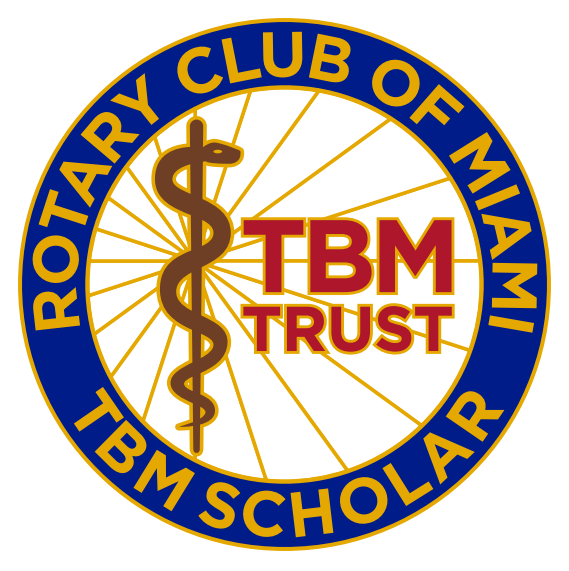 If you are a TBM Scholarship recipient and are in need of a pin, please contact Phil Seipp at admin@miamirotary.org with your scholarship year, medical school and your contact information.